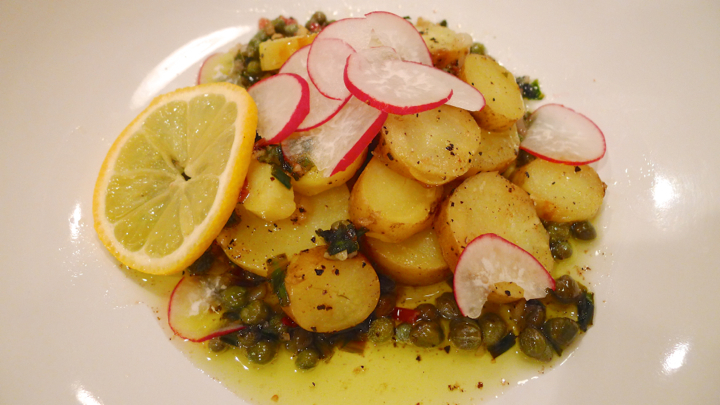 This is my new favorite potato salad! It’s a fun alternative to the traditional mayo-based potato salad (though I’ve been known to eat my way through a few containers of my moms recipe when visiting.) My favorite thing about this recipe is the RAMPS! That’s right, it’s ramp reason. It’ll be over before you know it though, so get them while you can. 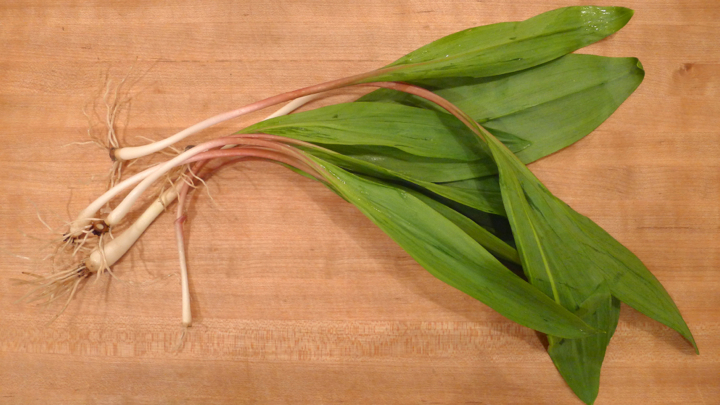 Ramps are kind of a green onion and garlic type hybrid. 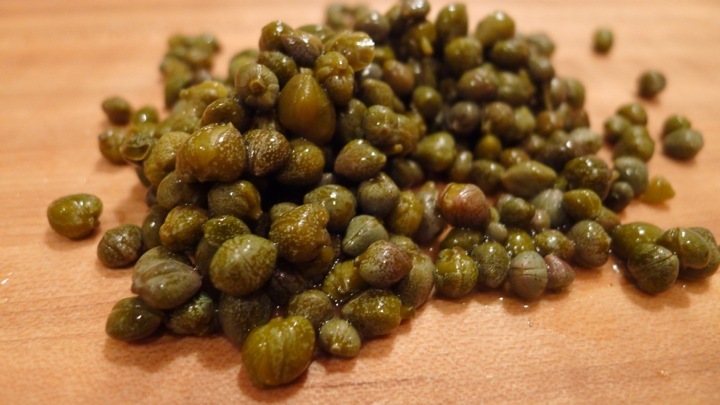 They’re only in season a few weeks in the beginning of Spring, and are usually found at farmers markets rather than your local grocery store. 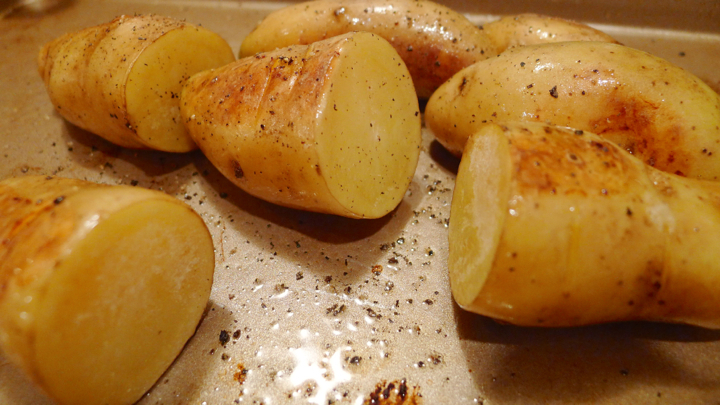 My favorite way to eat them is just simply roasted in a pan with a little salt and pepper. Preheat oven to 350 degrees. 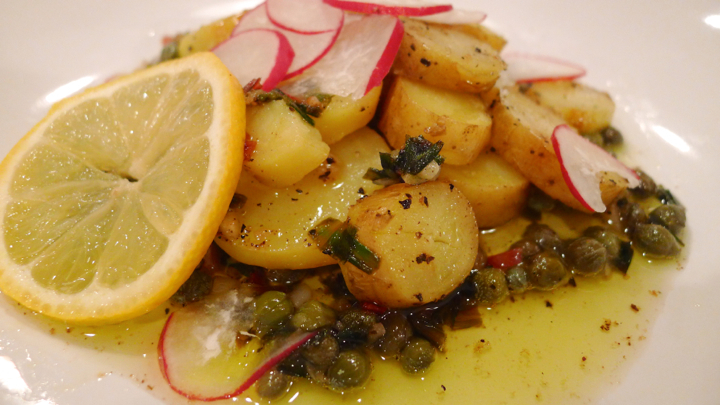 Drizzle the potatoes with some olive oil, and bake for 20-30 minutes or until golden and fork tender. While those cook, make the sauce. 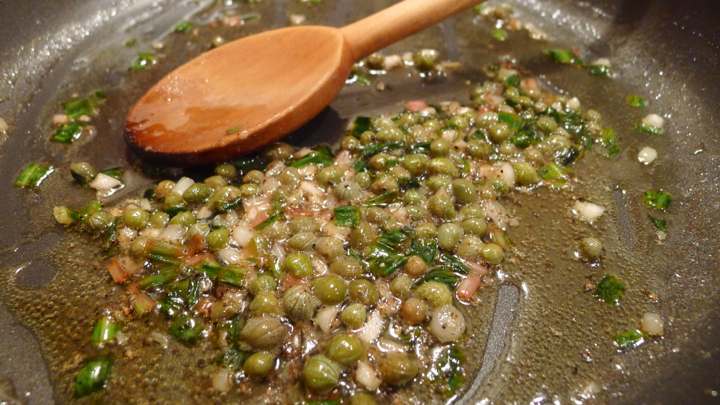 Sauté the ramps and garlic in the butter for 1-2 minutes, then add the lemon juice, capers, pepper, and olive oil. 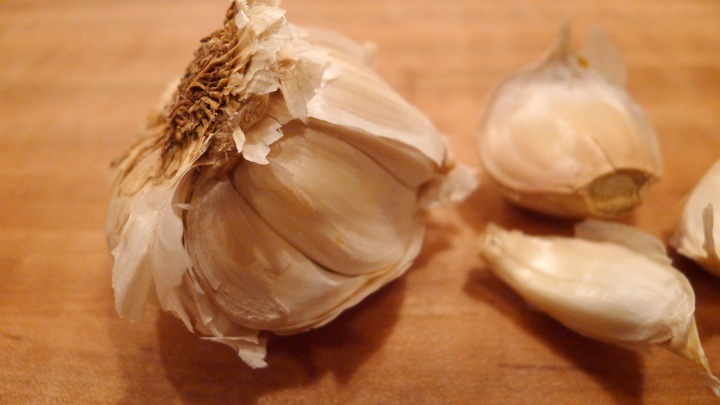 If you find it’s too tangy, just add more olive oil to lessen the acidity. 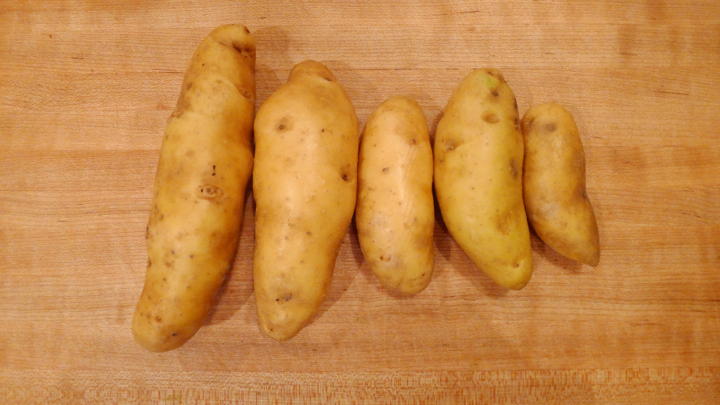 When the potatoes are ready, slice them into 1/2 inch pieces. 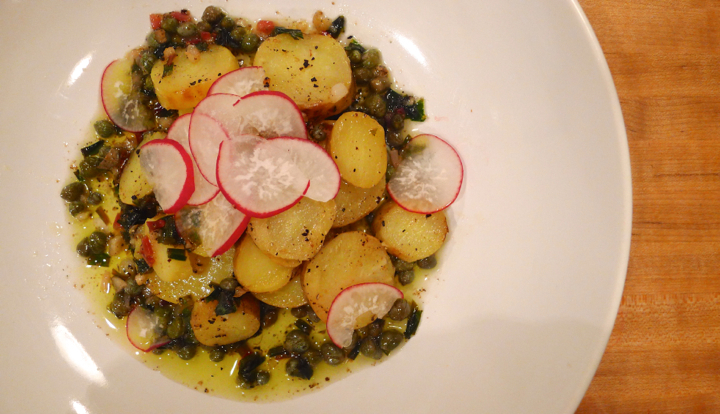 Pour some of the ramp and caper sauce into the bottom of the dish, then plate the potatoes on top and drizzle with the rest of the sauce. 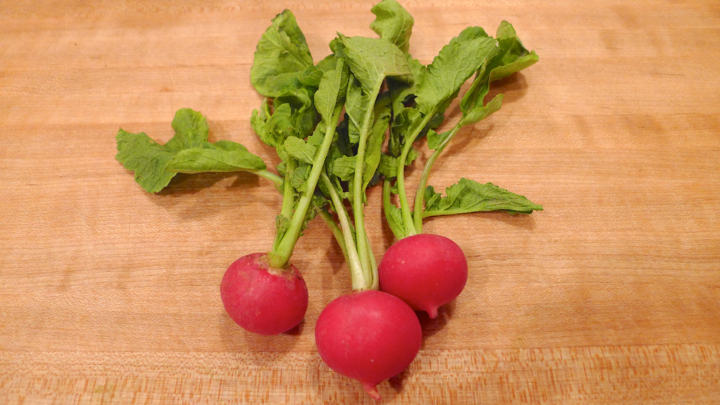 Top with some thinly slices radishes for color.